​Julia's book chronicles her struggle to regain control over her life and her body. Her experience was a blueprint for how not to let the system dictate the direction, pace, and objectives of one’s recovery. Keep Your Eye on the Prize—The Quality of Your Life! "Her humorous, tear-jerking, struggle-to-recover-against-all-odds story is a lesson in finding silver linings". 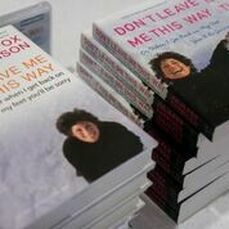 "Don't Leave Me This Way's unique tone and utterly un-maudlin appeal is perhaps best summed up by its spunky yet spiky subtitle..."
"...pulls readers through her most humbling and triumphant moments"
"4 stars out of 4"
"It's as if your wise-cracking neighbor, the one who can always come up with a biting yet hysterically funny story in any disaster, turned handicap into a stand-up routine. Garrison has an edgy sense of irony that prevents the horrendous events...from becoming too maudlin or depressing. Readers can bring this book to the beach and laugh out loud." ~Chosen by the American Association of Therapeutic Humor for a book award, "Furthering the Mission - Non-member: for the best nonfiction book written by, or edited by, a nonmember that reflects and advances the understanding of application of humor and laughter for their positive benefits".